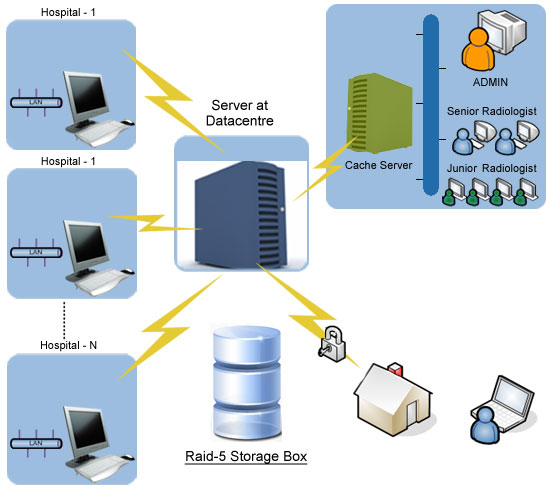 Enterprise InstaRad is a customizable radiology imaging solution designed for multi-center hospital networks. DICOM images of CTs, MRIs, ultrasounds and other modalities from multiple centers are loaded onto a centrally managed server from where they are distributed to multiple specialists or reporting centers. Specialists view and analyze the image or collaborate with peers from any place, at any time, over internet connections of any bandwidth. The diagnosis is reported back to the medical center in quick time. Enterprise InstaRad takes healthcare to a higher level. Multi-center organization workflow is difficult to manage but Enterprise InstaRad makes it easy. Enterprise InstaRad is a great time saver for patients, doctors, specialists, and the hospital staff. Referring specialists view images within seconds as streaming technology is progressive and prioritizes the streaming of clinically important data (images on demand). Irrespective of the bandwidth of the internet connection, the viewer downloads and displays the refined image almost immediately. As radiologists access radiographic images remotely and send back the diagnosis within minutes, physicians start treating patients at once rather than waiting for a specialist to arrive at the hospital. With Enterprise InstaRad, doctors and specialists are immediately alerted about a case via SMS or email. Priority emergency alerts are also available. Enterprise InstaRad’s interface is intuitively obvious i.e. easy to use and understand without extensive training. Enterprise InstaRad leads to cost savings for patients, doctors and hospitals. Enterprise InstaRad offers huge cost savings as it overcomes the technical complexity and cost overheads of managing multiple standalone servers at various centers. All the data is stored in a central server that is managed by an administrator. Enterprise InstaRad can integrate with existing HIS and RIS. IT and administrative costs are minimized while bandwidth utilization is maximized. Hospitals save on patient transportation costs, film costs, and equipment needed to store films. As specialists access the images from home, office or on the move, they save on commuting costs. All these cost savings are passed on to patients as lower medical charges. Apart from the server meeting certain minimum specifications, you don’t have to purchase new hardware or operating systems to use Enterprise InstaRad. Enterprise InstaRad works well on most servers — Dell™, HP®, IBM®, Sun Microsystems®, etc. Enterprise InstaRad is compatible with Windows®. The Linux™ and Mac version is under progress. Enterprise InstaRad accepts DICOM 3.0 images. Non-DICOM images are converted via a DICOM converter. Enterprise InstaRad has a fault tolerant architecture. This means two servers are always working together to ensure 100% uptime of the solution. Load balancing allows additional centers to be added to the network seamlessly. Enterprise InstaRad handles up to 6000 cases per center. Enterprise InstaRad supports a two-level reporting workflow. A report is prepared by a junior doctor and reviewed by a senior specialist before sending it back to the remote centers. The radiology solution also offers report addendum and key image support. Doctors and specialists can also collaborate in real time for better diagnosis. The central server has a workflow rule based engine that manages data from various medical centers and routes reports back to them. Based on rules and hierarchy, images are uploaded from remote centers via a DICOM upload utility onto the main server. The rule based engine assigns work as per availability of specialists, competence, and type of problem.